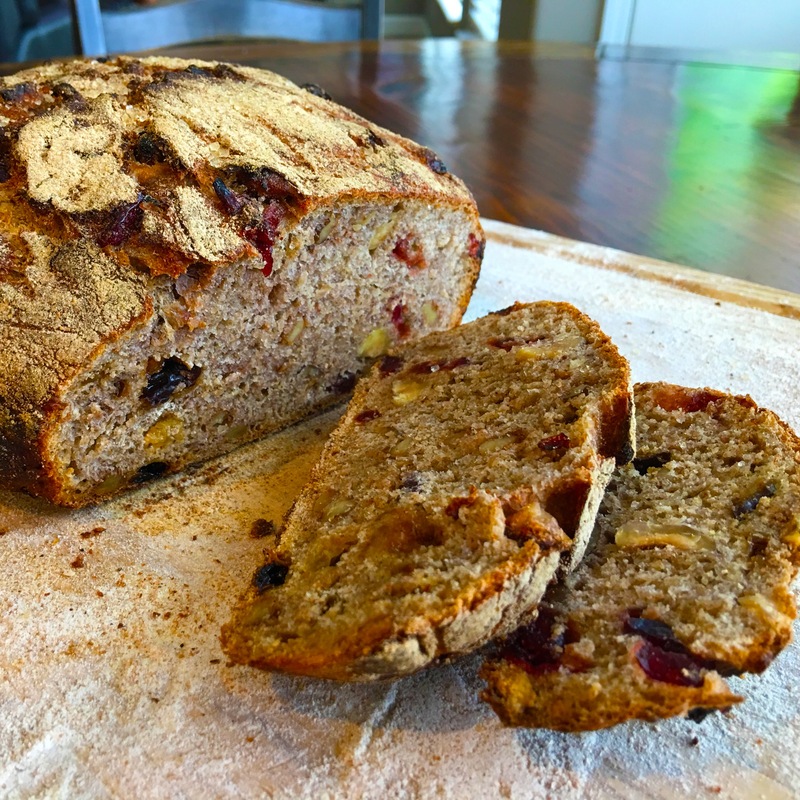 "My inspiration for this recipe comes from my love of fruit and nut breads and a cooking class I attended in the bay area many years ago. I have since lost the recipe from the class and have been trying to recreate it from memory. Some breads I have made are too sweet or the texture isn't right, but this one hits the spot nicely with the varied fruits and crunchy nuts! I like to serve simply with butter or toasted with sliced banana!" Paula Nolan, People's Choice winner of the 2016 Strolling of the Heifers' Great American Bread Recipe Contest. In a very large bowl, stir together the flours, salt, yeast and brown sugar. Add cranberries, raisins, dates, hazelnuts & walnuts. Add cinnamon and allspice. Stir to combine. Measure 41/2 cups of lukewarm water and add to flour mixture stirring with your hands to incorporate (the dough will be super sticky). Divide dough into two equal ball portions and place second dough ball into a separate bowl. Cover bowls with plastic wrap and allow dough to stand at room temperature overnight. They will puff up slightly. Flour a large board thoroughly then place one of the dough balls on it and knead by hand for 3-5 minutes until dough soft and smooth. Sprinkle dough with flour and cover again with plastic wrap and allow to sit at room temperature for another 2 hours. Repeat with the second dough ball. Place a Dutch Oven into a cold oven and then set temperature of oven to 500°F. Taking one of the dough balls at a time, dust dough with a generous amount of flour on top and bottom then sprinkle with turbinado sugar on top. Place dough into preheated Dutch Oven pot and cover. Bake for 30 minutes. Uncover and bake for another 10-15 minutes. Remove and allow to cool completely on wire rack. Repeat for second loaf. I baked this bread today and have a few suggestions. First, the ingredient list calls for light brown sugar but there are no instructions for its use. I chose to add it in with the other dry ingredients and that works out fine. I followed the baking instructions and tested the bread after 40 minutes of baking time with an instant read thermometer. It only registered 155F so I continued baking for another 10 minutes before it reached 200F. The top was a bit dark and there was a dark turbinado sugar ring around the side of the bread. I think next time I will bake the bread longer with the lid on and hopefully avoid too much browning. This bread is delicious with a crisp chewy crust and lightly sweet flavorful interior. It’s a hefty loaf and ingredients are easily halved if just one loaf is needed. Great tips, Lisa! Thanks for the heads-up on the sugar – it’s now added to the instructions. I’m glad you enjoyed the bread!